Voting for the fifth annual Akron Art Prize begins with an opening night reception from 5 to 9 p.m. this Saturday, Sept. 3. This year’s event features more than 200 artists showcasing paintings, photography, collage, graphic design, sculpture and more. 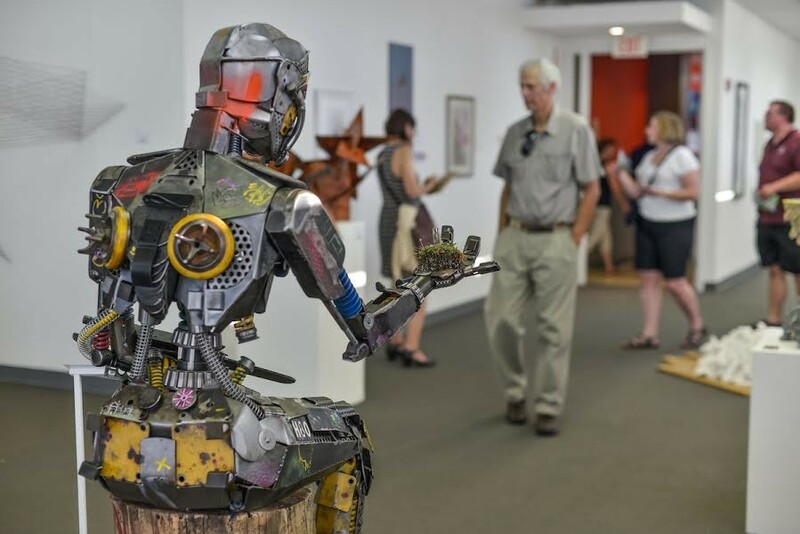 This year’s Akron Art Prize features several changes, including an increased prize amount totaling $16,000, as well as consolidating the event under one roof at Summit Artspace (140 E. Market St.). “We just had art intake over the weekend where we accepted over 200 entries, [followed by a] one-day professional photo shoot and then two days of intense art installation which will energize all three floors of Summit Artspace for the month of Akron Art Prize,” the coordinator of this year’s Akron Art Prize, Courtney Cable, said last week. Also new this year, additional categories and juried prizes have led to restructuring of the prize levels. The top prize winner will receive $5,000 and an opportunity to exhibit their winning work at the Akron Art Museum for a month following the competition. First place winners in two- and three-dimensional categories receive $2,000, and second place winners receive $1,000. Prizes also include $1,000 Artists’ Choice Award and a juried category, with two local arts and two civic leaders awarding four $1,000 awards. Later in September, organizers host a “Meet-the-Artist” reception at Summit Artspace from 6 to 9 p.m. on Thursday, Sept. 15. The event is designed to offer the public and artists a chance to converse and network. The evening includes DJ Ben Crazy and Kofi Boakye, a crosswalk painting activity with STEM middle school students featuring Random Cushing and light refreshments. Voting closes at 8 p.m. on Saturday, Oct. 1, with a finale reception from 8 to 10 p.m. Awards will be presented at 9 p.m., and DJ Ben Crazy will return. The free reception includes light hors d’oeuvres and a cash bar. The Akron Art Prize entries are viewable Thursdays through Saturdays from noon to 9 p.m. at Summit Artspace through the entire month of September. Voting is quick and easy through the Akron Art Prize app, free through the iTunes App Store and Google Play Store. Through the app, voters can view entries, curate favorites and cast their votes. The app makes voting more convenient with information like artist name and profile, entry title and description. The app can be downloaded and viewed anywhere, but votes can only be cast within the Akron Art Prize footprint. Each registered voter (ages 16 and older) may cast up to five votes, but voters who cast all five votes and fill out a brief survey will receive a sixth vote and be entered into a drawing for $100 gift card to the downtown Akron business of their choice. For those without smartphones, voting kiosks are available on each floor of Summit Artspace. For more information, visit akronartprize.org or facebook.com/akronartprize. Guests are encouraged to share their experiences on Twitter, Facebook and Instagram using #akronartprize16. The Akron Art Prize is sponsored by the Margaret Clark Morgan Foundation and coordinated by the Downtown Akron Partnership.